Is éard atá i Vailís agus Futúna (a dtugtar Críoch Vailís agus Fhutúna orthu go hoifigiúil) Comhroinn Fhrancach san Aigéan Ciúin Theas a bhfuil Túvalú siar ó thuaidh uaithi, Fidsí siar ó dheas uaithi, Tonga soir ó dheas uaithi agus Tokelau soir ó thuaidh uaithi. Tá sí dealaithe amach ó Pholainéis na Fraince. Tá 142.42 ciliméadar sa comhroinn agus tá daonra 11,558 aici de réir dhaonáireamh 2018, laghdú ó 14,944 in 2003. Tá trí oileán bholcánacha thrópaiceacha sa Chríoch agus roinnt oileáiní, agus tá sí roinnte ina dhá grúpa – Oileáin Vailís thoir thuaidh agus Oileáin Fhutúna (Oileáin Hoorn) agus Oileán Alofi, áit gan lucht mór cónaithe, thiar theas. Tá na hoileáin ina gcomhroinn Fhrancach thar lear (collectivité d'outre-mer) ón mbliain 2003 i leith. Roimhe sin bhí siad ina gcríoch Fhrancach thar lear (territoire d'outre-mer). Lonnaigh daoine i Vailís agus i bhFutúna 3,000 bliain ó shin, timpeall na bliana 700 RCh, nuair a áitríodh Fidsí, Samó agus Tonga den chéad uair. Dhéanadh an daonra sin cinéal criadóireachta a dtugtar “potaireacht Lapita” uirthi. Tá daingin chré nó chloiche agus leachtaí bróin ón ré is luaithe le feiceáil fós. Bhí nasc cultúrtha ag na hoileáin leis an Mhicrinéis, agus sa 15ú haois rinne ríocht Thonga ionradh ar na hoileáin. Rinne an dream nua nósanna sinseartha an oileáin a chlaochlú agus chuir siad córas nua taoiseachta ar bun. Tháinig Willem Schouten, captaen Ollannach, ar Futúna agus Alofi in 1616 agus é ag gabháil timpeall an domhain in De Eendracht. Tugadh Hoorn Eylanden orthu as Hoorn san Ísiltír, áit ar rugadh Schouten. Ainmníodh Oileain Vailís as an Sasanach Samuel Wallis, a ghabh tharstu in 1787 agus é ag teacht ó Thaihítí. Thosaigh báid míolta móra ó Mheiriceá agus ó thíortha eile ag tabhairt cuairt ar na hoileáin ón mbliain 1827 amach. Tháinig misinéirí Francacha in 1837 agus in 1842 d’iarr siad cosaint tar éis gur éirigh cuid den phobal amach. In 1887 chuir Banríon Uvea (Vailís agus Futúna) a lámh le conradh a chuir coimearcas Francach ar bun. In 1888 chuir ríthe Sigave agus Alo a lámh le conradh den chineál céanna. Cuireadh na hoileáin faoi údarás na [[an Nua-Chaladóin|Nua-Caladóine), coilíneacht de chuid na Fraince. In 1917 nascadh na trí ríocht thraidisiúnta leis an bhFrainc agus rinneadh Coilíneacht Vailís agus Fhutúna díobh. I rith an Dara Cogadh Domhanda thaobhaigh údaráis na n-oileán le Vichy nó gur tháinig coirbhéad de chuid na Fraince Saoire ón Nua-Chaladóin agus threascair an rialtas ar an 26 Bealtaine 1942. Tháinig aonaid de Chór Cabhlaigh Mheiriceá i dtír ar Vailís ar an 29 Bealtaine 1942. In 1959 vótáil áitritheoirí na n-oileán ar son críoch Fhrancach thar lear a dhéanamh díobh, stádas a tháinig i bhfeidhm in 1961 agus a chuir deireadh la smacht na Nua-Chaladóine. Tá an chríoch roinnte ina thrí ríocht thraidisiúnta: Uvea ar oileán Vailís, Sigave in iarthar Fhutúna agus Alo in oirtheacht Fhutúna agus ar oileán Alofi. Is é Mata-Utu príomhchathair na comhroinne. Rialaítear an chomhroinn de réir Bhunreacht na Fraince 1958 agus tá vóta ag gach duine atá os cionn ocht mbliana déag d’aois. Ceapann Uachtarán na Fraince an tArd-Riarthóir ar chomhairle na hAireachta Gnóthaí Baile. Toghann baill Thionól na Críche (Assemblée territoriale) uachtarán an Tionóil agus uachtarán Rialtas na Críche. Is éard atá i gComhairle na Críche na trí rí agus trí bhall a cheapann an tArd-Riarthóir ar chomhairle an Tionóil. Tá fiche suíochán sa Tionól agus toghtar a bhaill i gcomhair tréimhse cúig bliana. Toghann Vailís agus Futúna seanadóir amháin ar Sheanad na Fraince agus teachta amháin ar Thionól Náisiúnta na Fraince. I gcoitinne, cuireann binse breithiúna in Mata-Uta ceart dlí i bhfeidhm de réir dhlíthe na Fraince, ach cuireann na trí ríocht gnáthdhlí traidisiúnta na críche i bhfeidhm i gcáis neamhchoiriúla. Tá an Chúirt Achomhairc in Nouméa sa Nua-Chaladóin. Bhaineann an chomhroinn feidhm as an bhfranc mar airgid. Is buanbhall í de Rúnaíocht Phobal an Aigéin Chiúin agus is breathnóir í ag Fóram Oileáin an Aigéin Chiúin. Bíonn tréimhse the fhliuch ag na hoileáin ó Mhí na Samhna go Mí Aibreáin. Leanann stoirmeacha na cioclóin thrópaiceacha. Bíonn tréimhse fhionnuar thirim ann ó Mhí na Bealtaine go Mí Dheireadh Fómhair de bharr na dtrádghaoth anoir aneas. Titeann meánbháisteach bhliantúil de 2,500 miliméadar suas go 3,000 miliméadar. Is é 80% an mheánbhogthaise agus is é 26.6° C an mheánteocht. Níl ach 5% de na hoileáin ina thalamh curaíochta, agus bíonn barraí buana ag fás ar 20% den talamh. Is mór an fhadhb an dífhoraoisiú: baintear feidhm as adhmad mar bhreosla agus níl ach beagán den tseanfhoraois ann. Tá creimeadh ar shléibhte Fhutúna dá bharr. Fáisceadh Vailísis agus Futúnais as an bPróta-Pholainéisis agus tá cosúlacht fós eatarthu. Tá trí shainréim sa Vailísis. Úsáideann taoisigh an teanga urramach agus úsáideann gnáthdhaoine í más ag caint le taoiseach nó le Dia atá siad. Chomh maith leis sin, úsáideann gnáthdhaoine í agus iad ag caint ar Dhia nó ar dhuine ríoga. Is í an dara sainréim an ghnáth-theanga, agus ina dhiaidh tá teanga lábánta bharbartha ann. Anois, áfach, tá Fraincis ag dul go mór i bhfeidhm ar an Vailísis. Is beag a ghéill an Fhutúnais don Fhraincis ar dtús, ach timpeall an Dara Cogadh Domhanda thosaigh laghdú mór ag teacht ar líon na gcainteoirí, go háirithe toisc gur imigh an oiread sin daoine chun na Nua-Chaladóine. Anois meastar go bhfuil sí i mbaol. Léirigh daonáireamh 2018 go ndúirt 59.1% díobh siúd a bhí ceathair déag nó níos sine gur Vailísis is mó a bhí á labhairt acu sa bhaile (60.2% in 2008) agus dúirt 27% gurbh Fhutúnais í (29.9% in 2008). Fraincis a bhí á labhairt ag 12.7 (9.7 in 2008). Ar Oileán Vailís ba iad na teangacha ba mhó a labhraíodh sa bhaile an Vailísis (82.2% le hais 86.1% in 2008), an Fhraincis (15.6% le hais 12.1%) agus an Fhutúnais (1.9% le hais 1.5% in 2008). Ar Oileán Fhutúna ba iad na teangacha ba mhó a labhraíodh sa bhaile an Fhutúnais (94.5% le hais 94.9 in 2008), an Fhraincis (5.3% le hais 4.2% in 2008) agus an Vailísis (0.2% le hais 0.8 in 2008). Tá tábhacht ar leith leis na sean-nósanna sa chomhroinn. Baineann siad leis an teanga, leis an gceol, leis an rince, leis na ceirdeanna agus na deasghnátha. Is mór an bhaint atá ag an gcáva mar dheoch dheasghnáthach le saol sóisialta agus reiligiúnach mhuintir na críche. Nuair a tháinig na misinéirí Francacha in 1837 bhí sé á úsáid le hómós do na déithe; tá sé á úsáid fós mar bhunchuid de na caibidlí poiblí agus príobháideacha. (Chomh maith leis sin, is féidir é a ól ar a shon féin.) Ní féidir deasghnáth an cháva a bhur ar siúl mura bhfuil duine ríoga i láthair. Tá baint ag an gcáva leis an “Katoaga,” nuair a chruinníonn daoine le chéile i láthair rí chun ócáid mhór a cheiliúradh – féile nó tórramh nó eile. Baineann tuairim is 80% de na hoibrithe a mbeatha as feirmeoireacht (cnónna cócó agus glasraí), beostoc (muca den chuid is mó) agus iascaireacht. Tá timpeall 4% den daonra ar fostú ag an rialtas. Faightear teacht isteach ó dheontais de chuid rialtas na Fraince, ó cheadúnas iascaireachta a thabhairt don tSeapáin agus don Chóiré, ó chánacha iomportála agus ó sheoltáin airgid ó oibrithe easaoránacha sa Nua-Chaladóin, i bPolainéis na Fraince agus sa Fhrainc. Tá earraí láimhe, copra, iascaireacht agus adhmad ann mar thionscail. Níl ach aon bhanc amháin ann, Banque de Wallis-et-Futuna, fochuideachta de BNP Nouvelle-Calédonie. Bhí 11,558 duine ina gcónaí sa chomhroinn in 2018 (72.1% ar Oileán Vailís, 27.9% ar oileán Fhutúna). De shliocht Polainéiseach a bhformhór mór agus de shliocht Francach an chuid eile. Ó na 1950í i leith tá ag teip ar a lán daoine sa chomhroinn obair a fháil sa bhaile, rud a thug orthu dul chun na Nua-Chaladóine, áit atá níos rathúla agus mar a bhfuil sé de cheart acu, mar shaoránaigh Fhrancacha, cur fúthu agus post a fháil. In 2014 dúirt 21,926 áitritheoir de chuid na Nua-Chaladóine (daoine a rugadh ann nó sa chomhroinn) gur de mhuintir Vailís agus Fhutúna iad. Tá tuairim is céad ciliméadra de bhóithre ar Vailís agus sé cinn déag acu pábháilte. Níl ach fiche ciliméadar ag Futúna agus gan aon chuid pábháilte. Tá dhá chaladh mhóra ann, Mata-Utu agus Leava i bhFotúna, agus iad á n-úsáid ag cabhlach trádála na comhroinne, trí long (dhá long paisinéirí agus tancaeir ola) agus 45,881 tonna iontu. Tá dhá aerphort ann, Hihifo ar Vailís agus Pointe Vele ar Fhutúna. Tá ocht mbunscoil déag sa chomhroinn, dhá cheann déag ar Vailís agus sé cinn ar Fhutúna, agus os cionn 5,200 dalta ag freastal orthu. Tá sé ardscoil shóisearacha ann agus aon ardscoil shinsearach amháin. Tá ardscoil talmhaíochta ann freisin. 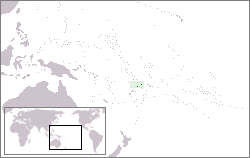 ↑ 61-814, 29 juillet 1961, "Conférant aux îles Wallis-et-Futuna le statut de territoire d'outre-mer": http://www.legifrance.gouv.fr/affichTexte.do?cidTexte=JORFTEXT000000684031&categorieLien=cid. ↑ Robert Langdon (eag. ), Where the whalers went: an index to the Pacific ports and islands visited by American whalers (and some other ships) in the 19th century, Canberra, Pacific Manuscripts Bureau, 1984, p.32. 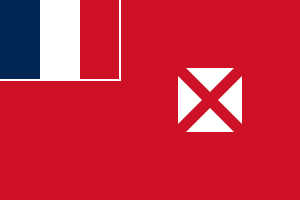 ↑ "Wallis and Futuna Islands". ↑ 6.0 6.1 6.2 "Les premiers résultats du recensement de la population 2018 - Principaux_tableaux_population_2018" (ODS) (fr). ↑ 7.0 7.1 7.2 "Tableau Pop_06_1 : Population selon le sexe, la connaissance du français et l'âge décennal" (XLS) (fr). Archived from the original on 2019-04-07. ↑ "Wallis & Futuna Business Law Handbook: Strategic Information and Laws" (1 January 2012): 37–. Int'l Business Publications. ↑ "L’évolution de la population par communauté d’appartenance". ↑ Cartographie des établissements du second degré. Wallis et Futuna. Tugadh an leathanach seo cothrom le dáta an 17 Aibreán 2019 ag 12:26.